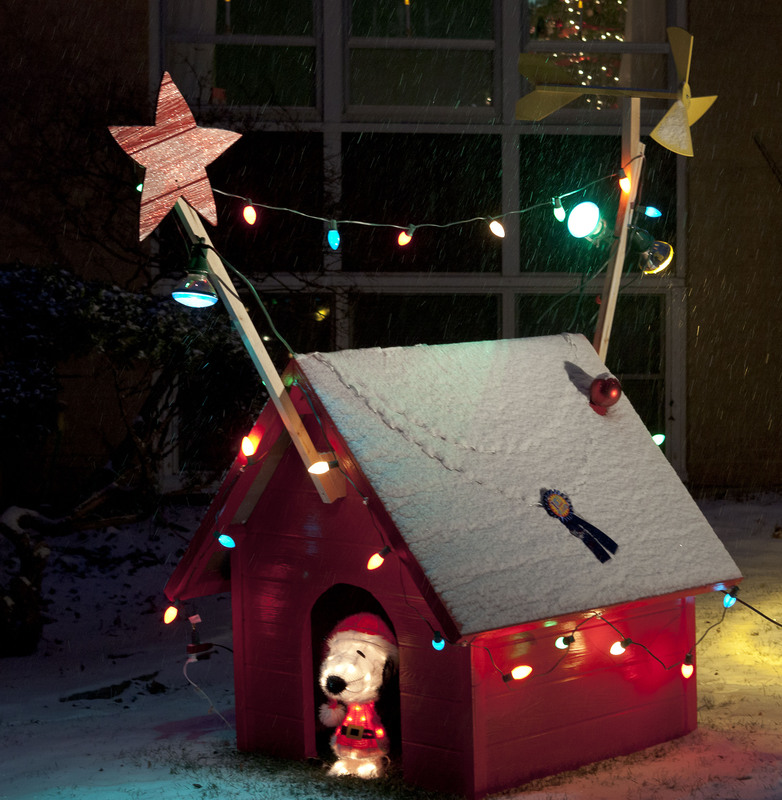 Last year, Dale joked that once we were settled into our house we’d start working on creating our own kind of Griswold Christmas Spectacle by making an over-sized decorate doghouse like Snoopy had in A Charlie Brown Christmas. 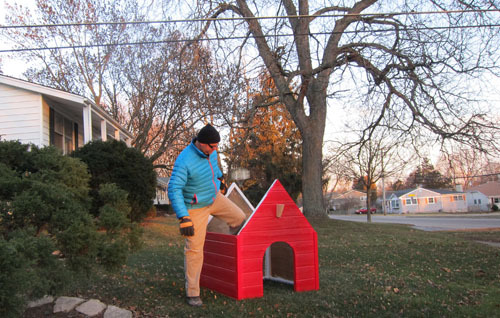 Dale’s mom came to visit last week and she’s been asking when we were going to have this cute little dog house set up (she’s a dog person but she loves her grandkitties with the best of them). So Dale told her he was going to put her to work when she came to visit. Sure enough he picked her up at the train station and headed straight for the hardware store. Needless to say I was excited! So was Jackie, Dale’s mom! The little opening is about 20 inches. I went back upstairs and let them make some progress. By the following day they had gotten the thing put together, primed and had even started gathering the proper accessories! I was amazed! We went to the store and acquired the proper flood lights, the chains, and (my big contribution) the “1st Prize” award. 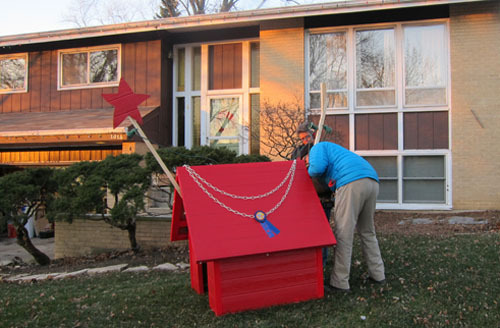 Dale set about making the star and the weathervane out of scrap pieces of wood. I brought some glitter. Obviously. For the star! And the red Christmas bulb. Dale made the house so it’s very sturdy but can be disassembled reasonably quickly. 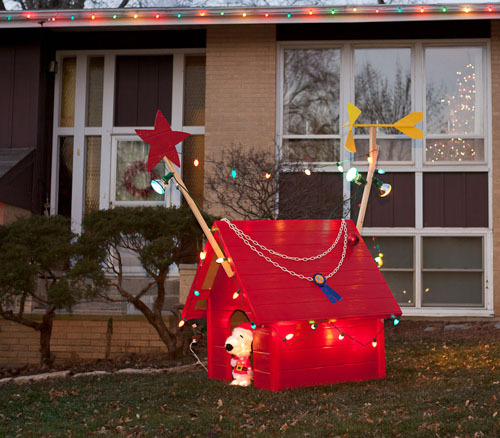 So he and his mom set about setting it up on the front yard! This is them, adorably carrying the spotlights out into the yard! Dale brought the frame out! The roof and handmade star were up next. 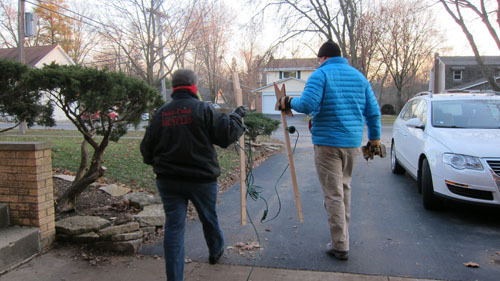 In this pic, Dale and Jackie are adding the weathervane that Dale made. And how cute is this!? 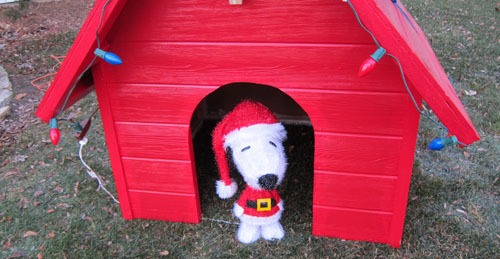 Jackie felt we needed a little Snoopy and she was totally right! We picked up that little 18-inch Snoopy at the hardware store. I love how much it matches the cartoon! We even added a little red bulb. He’s adorable! And, like clockwork? It started to snow! We’ve had a few gawkers stop as they drive by and we even had someone trudge through the snow to get a pic with Snoopy. It’s been a fun conversation piece for the neighbors. This was a design on the fly project, no plans were used. I would give you exact measurements but its currently packed away until December, I can tell you the entire thing was made from two 4×8 sheets of siding as you suggested. – To stiffen up the structure I ripped a couple 2×4 8′ to down the center and framed all edges of every panel. – The roof is hinged and thus lifts off in one piece and folds flat like a book. – The sides are held together with 8 screws, two per corner. – According to the internet the snoopy dog is 18″ tall. For a reference, I am 6′ tall. If you build one be prepared to see a lot of stopped cars in front of your house, people really like it. Just wondering if you got the dog house out of storage yet. Trying to figure out the dimensions. We’ll be taking it out of storage this weekend. I’ll ask Dale to elaborate on the dimensions. Can you provide the dimensions please? I’m a peanuts fan, and love this. My son is starting to do his Eagle project. For his project he wants to build a snoopy dog house that has a roof that lifts up, so that anyone can drop off donations of food for our local shelter. If you have posted or do post the sizes please let me know. This morning I went out and measured the house and made a simple drawing showing the component sizes and bracing. This should offer enough information for most people to make a version of their own. 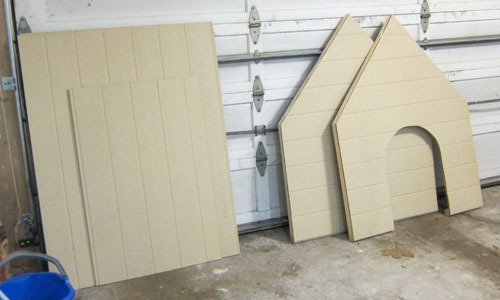 All the panels are made from two 4×8 sheets of exterior grade material. All other materials were items I had around the house. Just seeing this for the first time. Awesome job! What material did you use for the house? It was just exterior sheathing, Picked it up at Home Depot. 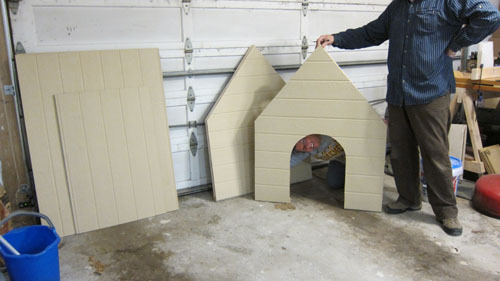 Building snoopy house for my grandchildren. What size and kind of hinges did you use for the roof?? Having a little trouble figuring out how that works. Do both sides have a 2×4 mounting board for the hinges?? Yes. I used door hinges that are attached to two 2×4 mounting boards. 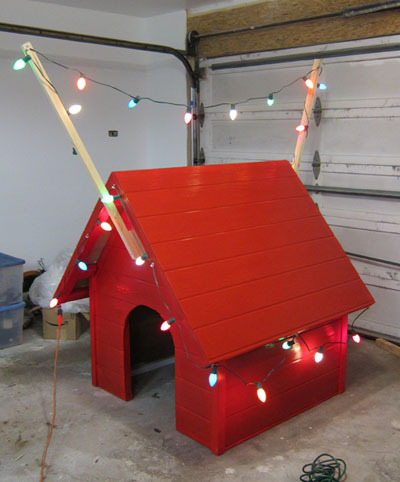 I plan to make the indoor version for my workplace (I work at a veterinary hospital) so it will be likely made with cardboard. I love this idea!